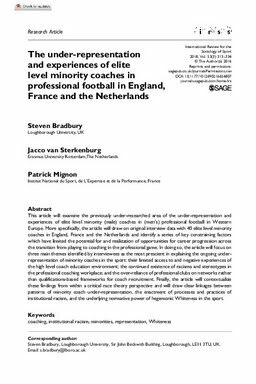 This article will examine the previously under-researched area of the under-representation and experiences of elite level minority (male) coaches in (men’s) professional football in Western Europe. More specifically, the article will draw on original interview data with 40 elite level minority coaches in England, France and the Netherlands and identify a series of key constraining factors which have limited the potential for and realization of opportunities for career progression across the transition from playing to coaching in the professional game. In doing so, the article will focus on three main themes identified by interviewees as the most prescient in explaining the ongoing under-representation of minority coaches in the sport: their limited access to and negative experiences of the high level coach education environment; the continued existence of racisms and stereotypes in the professional coaching workplace; and the over-reliance of professional clubs on networks rather than qualifications-based frameworks for coach recruitment. Finally, the article will contextualize these findings from within a critical race theory perspective and will draw clear linkages between patterns of minority coach under-representation, the enactment of processes and practices of institutional racism, and the underlying normative power of hegemonic Whiteness in the sport.